Splash pages, you gotta love 'em. A blank canvas where the artist can hit you with a large dose of illustrated 'wow'. This week, it's my favourite splashie from my pull-list of the last month; Barry Kitson rendering Galactus being summoned by Reed Richards to intervene in the Kree/Inhuman war, and arriving unamused at the scale of the conflict he was asked to partake in. Barry Kitson is a freak in how his crisp clear lines can make even the most cluttered scene like an all out star wars seem easy on the eye to read. What added to the drama of this moment and made it so impacting, was the build up writer Jonathan Hickman gave the arrival of ol' purple boots on the page prior (left). Back to Barry, he's doing some of his best work ever on Fantastic Four, and while every page of issue #602 literally had an 'Oh sh$%#t!' moment, he handled every single one of them with ease. 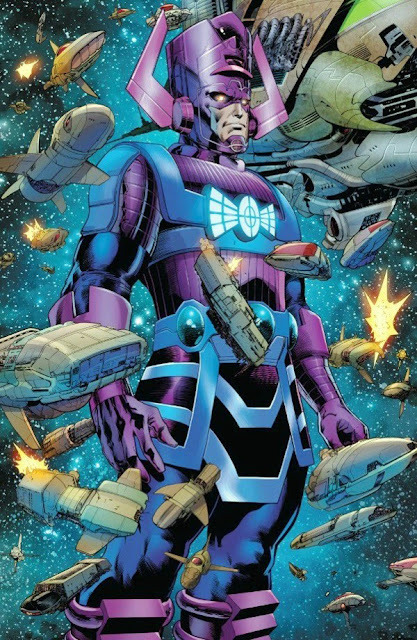 While Galactus interrogates Reed and Sue for calling him to such a minor skirmish, he only has to wait until the last page for the opposition of his dreams. Who is that? 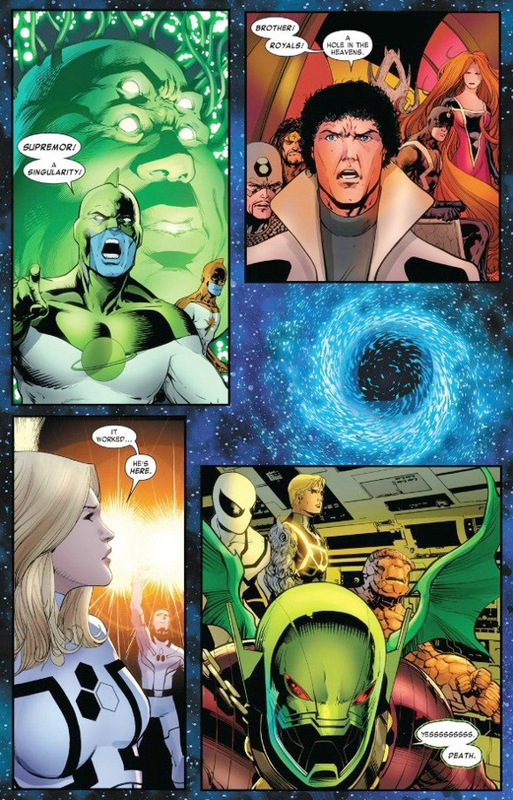 Look for Fantastic Four #602 to find out! For more great splashies, click the jump. I love Marvel cosmic. I'm beginning to think it's the best part of the Marvel U. If DCnU really wants to take off they should look into doing something similar. Having everything taking place on ol' backwater earth seems so parochial. I agree Pensol. I'd go one step further to say healthy cosmic adventure is the first step in being a true pulp adventure producer. DC has the Legion, Adam Strange, the Green Lantern franchise, The New Gods, and a lot of other great concepts, Marvel's seen to have that bit more gas, maybe because they are just a little more intertwined. 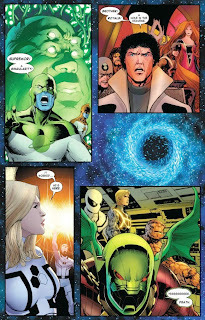 Heaven forbid DC ties everything into the GL explosion, but with the focus being placed on War titles within the line, and All Star Western in that genre, we could get a title that locked into the tales of DC's non-ring bearing space heroes.